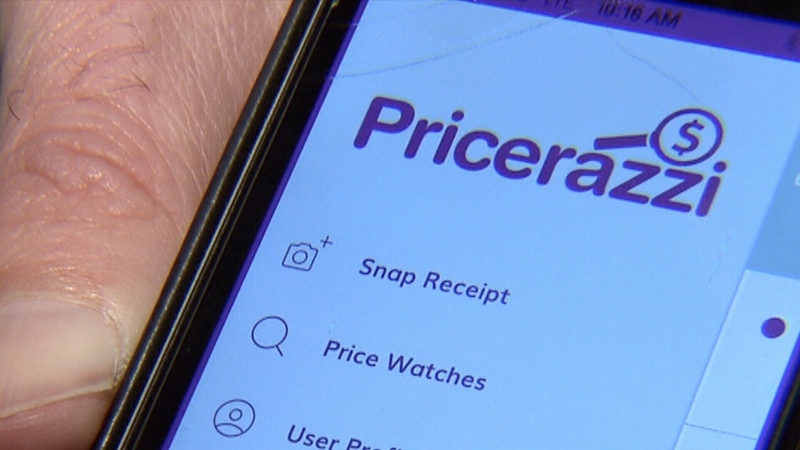 Pricerazzi is a new price app that was launched in October and saves you time and effort when trying to get a store to honour a lowest-price match guarantee. The app does the work for you. You take a picture of your receipt and the app searches more than 1,000 stores over the eligibility term of the store’s price match policy. When a price drop is found, you are notified of the money you can get back. The app is the brainchild of Declan McDonald, from Manitoba, who came up with the idea to simplify the search process. It began 18 months ago when he was shopping for new kitchen appliances. After spending $7,000 he was offered a lifetime price guarantee. He spent many hours searching online and he was able to save $1,500 on his purchase. He decided to turn it into a business. “Getting money back is awesome,” McDonlad said, as he demonstrated how the app works. He went shopping with us at London Drugs and was able to get $78 back on the lowest-price guarantee on two items. The app did all the work. Prizerazzi is free at the app store but there is a 15 per cent service fee when you get money back so if you save $100 by using the app, you pay $15. For that 15 per cent, the app sends you the original retailers price match policy and a photo of the lower price availability and keeps checking for lower prices until the price match guarantee period runs out. If another savings is found, Prizerazzi says the service fee will be based only on the additional savings. So if that TV dropped another $10, you’d pay $1.50 to find out where, and then could request more money back from the store offering the lowest price guarantee.